Rounding out his latest ‘Infinity’ trilogy, Jim Starlin’s THANOS: THE INFINITY FINALE serves as a fascinating return to the psychedelic insanity of Marvel’s cosmic heyday. In the wake of his latest resurrection by Lady Death following his apparent suicide, Thanos embarks on a wildly dangerous crusade to put an end to the seemingly unstoppable Annihilus, enlisting several of the Marvel Cosmic Universe’s familiar faces in a battle to preserve reality itself. Throughout it all, Starlin utilises Thanos perfectly as a protagonist rather than an antagonist, with his unashamed desire for self-preservation and trademark bluntness making him a rather compelling leading man. There’s also a nice balance between him using both his intelligence and his not inconsiderable powers, something other writers have a tendency to neglect. His interactions with the likes of Thor, Doctor Doom and Gladiator in the early portion of the book provide both humour and drama in equal measure, although his self-serving desire to preserve for posiverse from genocide keeps him firmly on the borderline between hero and villain. Full disclosure: this is a dense, challenging read, packed with Starlin’s distinctive overwrought dialogue and bold, ambitious concepts. A far departure from some of the broad, simplistic fare which passes for ‘cosmic’ storytelling these days, Starlin peels back the very layers of reality here as Thanos and Adam Warlock attempt to prevent the posiverse from being utterly destroyed by Annihilus and his swarm. If Starlin’s story is one of multi-layered nuance and unconventional narrative flow, then the artwork which accompanies it – provided by the trinity of Rom Lim, Andy Smith and Guru-eFX – is about as subtle as an Infinity Gauntlet to the jaw. Bold, in-your-face splash pages abound, crammed with larger than life characters doing battle in front of impressive backdrops. Lim’s pencils lay things out impressively with scale and flair, Smith’s inks add a pleasing level solidity and depth to the characters, and Guru-eFX’s colours are both bright and dynamic. This is a fantastic looking book, no doubt about it, and the sheer scale of both the characters and the conflict are echoed impressively in the artwork itself. It’s not without its faults, however; The “Pip the Troll” side-story is an odd choice, and detracts somewhat from the epic cosmic warfare with a fairly jarring clash of tone. Also, some of the latter pages may stray a little too heavily into hallucinogenic, consciousness-expanding fare, with Thanos and Warlock heading to the very top of the cosmic hierarchy to meet “Above-All-Others”, the architect of everything. We’d never think of condoning drug use here at the Big Comic Page, but this certainly strikes me as a book that the reader would appreciate a lot more if they were… well… let’s say ‘medicated’. 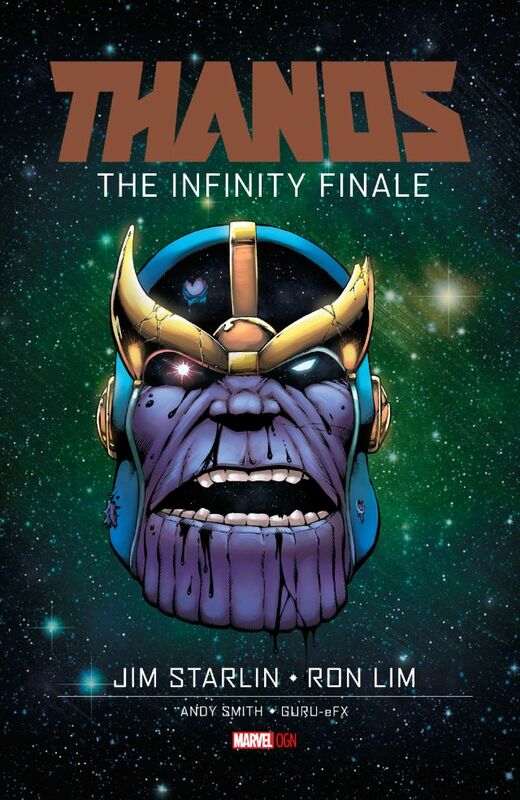 Overall though, in spite of its occasional flaws, and the fact that this is definitely a book that requires more than one read-through to fully wrap your head around, there’s no denying that Starlin’s mixture of dense prose and mind-expanding, poetic storyline beats – not to mention the absolutely jaw-dropping artwork – make THANOS: THE INFINITY FINALE a truly memorable and highly recommended experience. You can purchase Thanos: The Infinity Finale GN from Turnaround Publisher Services (who generously provided the review copy of this title) via their official website.